The only thing more awesome than the slow-travel lifestyle is the people you meet and get to know along the way. The stories you can share, memories you can create, or the inspiration such people can bring is… incredible. 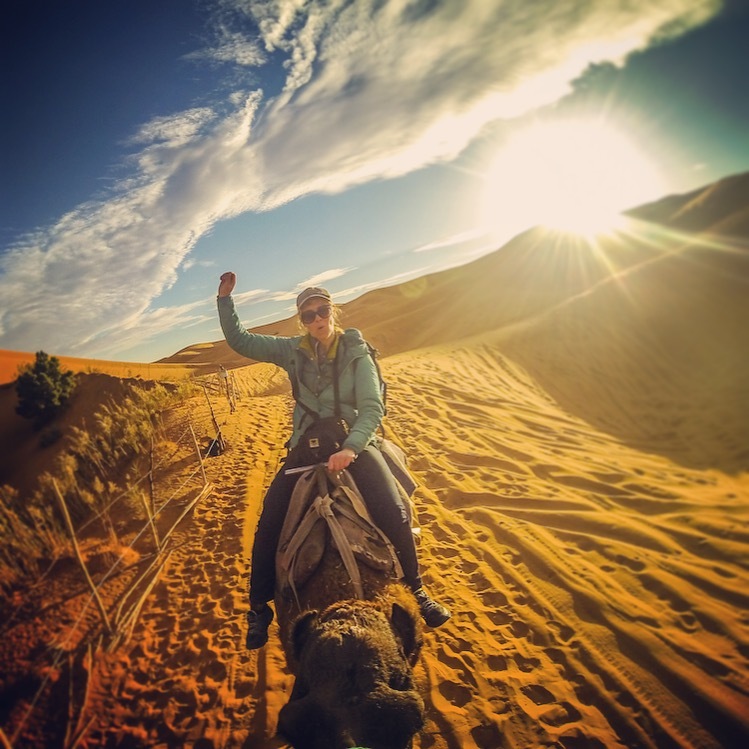 What is even cooler though is when you meet people daring to travel off the beaten path… to places most people would never even think of visiting. Like Africa for instance. Or more specifically: Morocco! 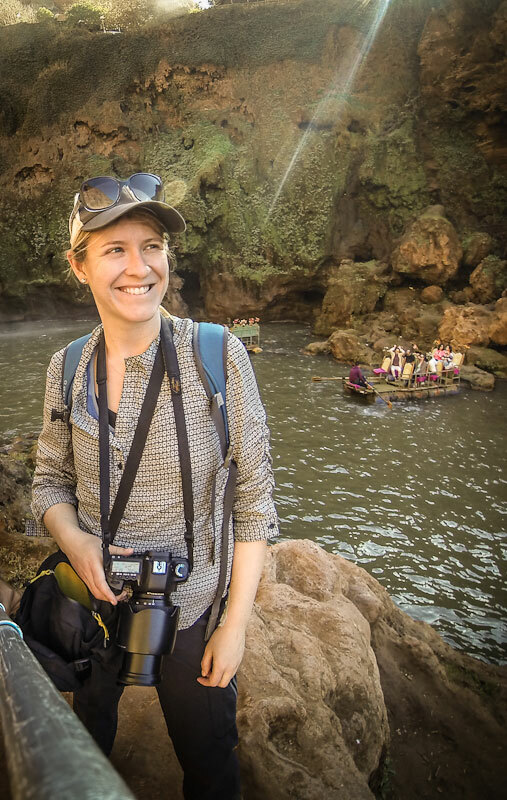 When’s the last time you heard someone say “Hey, I’m going to Morocco!”? Never mind them going there to make it their home base. Well, turns out, I now know someone who did exactly that. I was so intrigued by her story that I asked her to answer some questions for me (to share on here). And she agreed to do it. Thank you Stefanie. Your insights are truly inspiring! 1. Where are you originally from and where does your world travel gene come from? I was born in Montana and got a healthy dose of adventure growing up in the American West. It has cemented in me a love of the outdoors and experiencing a place through sports like hiking, skiing and biking. I think the phrase “world travel gene” is a great way to describe it because I really think it was something I was born with. As a kid, I loved hearing the stories of great adventurers and travelers and I was attracted to people who had seen unique areas of the world. When I began reading, I asked for travel books and guides, especially about Africa. I was obsessed with Africa, which really makes no sense with my German heritage and with no immediate ties or connections to that continent. I would study guide books on African animals, listen to tribal music and collect African-made artifacts. I actually tried to convince my parents when I was 18 to let me travel alone to Africa to retrace parts of the Livingstone expedition. I even put together a travel plan that I showed my high school teachers. Luckily my parents saw the dangers of such a trip and did not let me go. However, that obsession never let go until on a winding path 11 years later, I’m now living in North Africa and planning trips across the continent. 2. How long have you been traveling and where are you right now? I’ve been traveling for a year now. I actually came back to the place I started out in, Morocco, because it’s such a great place to base with easy access to Europe and other parts of Africa. 3. It is often assumed that world travelers have rich parents who make their world travels possible. Is this the case for you or how do you fund your travels? Although my parents have been extremely supportive in my travels, they are not footing any of the bills or providing any financial assistance. This is a endeavor I took on myself, a challenge I made to fund my own travels through working remotely or locally. When I first started thinking about leaving my full-time job to move abroad, I had side gigs as a freelancer so I knew I could bring some of this work with me. However, I didn’t want to move to a foreign country without having something else set up. So I took one of the easier routes and found a job teaching English in Morocco. It turned out to be a great way to get established in a new place. I had contacts and friends right away, I had help finding a place to live and I could cover my living expenses while I grew my online business. And although I only taught for three months, that initial job led to other opportunities. I started using my professional marketing skills to consult for international companies while continuing my online work. 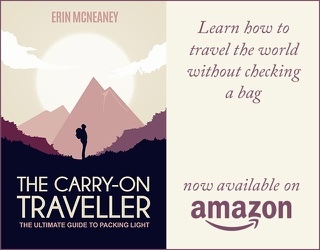 Another lesson from my travels is that you may find unique ways to earn money. I absolutely love the treasures from Morocco so I’ve recently jumped into eCommerce and I’m now selling items on an Etsy store. 4. What was the one defining moment (if there was one) that made you decide “hey, I’m gonna travel and work – as a digital nomad – from abroad!”? I had the dream of living abroad for a while and I was always reading about people who had this amazing lifestyle of seeing the world while working. After spending most of my twenties dreaming about it but not really taking the steps to try it, I decided I needed to stop asking “why” and start saying “why not?” I’ve always valued experiences over possessions and so buying a home and settling down in one spot never really appealed to me. I had spent nine years in web, marketing and video production so I had a lot of skills that could travel with me. But I think the real turning point for me was clarity on why being a digital nomad really fits who I am: I can create my own jobs online, meet and work with interesting people from all over the world, have the freedom to make my own schedule and have time for exploration and adventure beyond the two or three weeks vacation time I normally had in my full-time jobs. Once I figured this out, it was pretty clear this was the route to take. 5. How do your family and friends react to you being away from home? I had been talking about traveling for a while so I don’t think it was a huge surprise when I decided to go. I think there was some concern from my family as a woman traveling alone (I had my own doubts about that) but that’s definitely eased since I’ve figured out better ways to communicate with everyone back home. The coolest part of this experience is how it has connected the people around me. My friends and family read my blog and message me about my experiences. 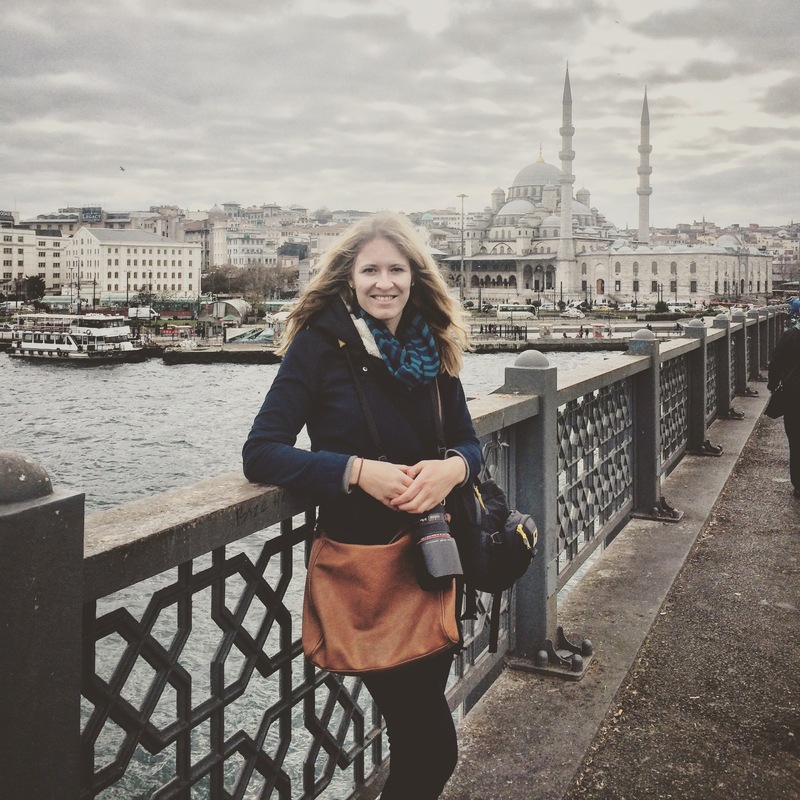 I traveled to Istanbul to see my sister, who was living there for a college semester abroad. I’ve had people I’ve known for awhile who have reached out to me for advice on this lifestyle. And it’s come full-circle with my dad who has always had his own love of adventure but had never traveled outside North America until a year ago. Now he will have a total of three new continents under his belt after his travels last year and when he visits me in Africa later this month. 6. What are some of your favorite places/destinations and why? I feel like I just got started with traveling and there is so much more I plan to see. I’m not really trying to check off countries and destinations quickly. For me, it’s more about really getting to know a place, understand the culture, live alongside locals and explore before moving on. I think one of the best surprises I’ve found so far is stumbling onto a foreign country (as I did with Morocco) and despite all the differences from your own home, finding you really enjoy living there. Most people think Morocco has camels, desert and exotic decor but it’s so much more than that. There is a great crossroads of culture here with European and Middle Eastern influences, multilingual and international atmosphere, diversity of people and a variety of landscapes from mountains to ocean to sand dunes. As for other places I’ve traveled to, I have a hard time picking favorites because I usually find something I love everywhere: Italy for its art and food, Istanbul for its architecture, London for its museums, Alaska for its outdoor adventure, the list could go on and on. 7. What are your top five must have items you would never travel without? I’m a big gear junkie and since my day to day work changes so much – I may be video editing in the morning, developing a website in the afternoon and then shooting photos for a blog later – I have my “digital nomad kit” ready for whatever comes. I always pack my dependable MacBook Pro laptop, an external hard drive, my iPhone, my Canon 5D Mark II camera and my Osprey Farpoint 40 backpack . The backpack is great because it protects my laptop and gear and yet I can still pack clothes in it for shorter trips. 8. To someone reading this who might think “Lucky you. I wish I could travel like that”. What would you tell them? It’s so much more accessible and doable than many people think. The way we work is changing rapidly and companies are realizing that people want more flexibility and freedom in their jobs. There are many job sites devoted just to digital nomads; they list companies who will hire you wherever you want to work (and often have great benefits too). Freelance is another route and again, there are a plethora of websites out there for finding freelance work. I think some people would be surprised at jobs and skills that you can travel with. It’s not just web and computer work, there are opportunities for healthcare professionals, research, education, fitness, etc. I think this lifestyle particularly attracts people who can adapt to change and challenging situations, think out-of-the-box, and have an entrepreneurial bend. Another piece of advice I got: if you’ve done the research and have the plan in motion, then it’s really more about getting over the fear of the unknown and learning to jump. It’s amazing how things will work out, maybe not in the way you expected but for the better! Thank you again Stefanie for taking the time to answer my questions. I can’t wait to travel Africa again (I was in Uganda in 2005) – especially now that I’ve heard you talk about it. I truly enjoyed your sharing and know others will love it as well. To learn more about Stefanie, check out her blog at: www.kiltscreative.com. As she mentioned, you can also find her on Etsy – here!